Tschimmhook - Stainless steel Dough Hook for KitchenAid! TschimmHook® the quality attachments for professional needs… made with stainless steel of course! For anyone who is looking for that special accessory for KitchenAid machines. Very durable, easy to clean and one of a kind! Over the past century, more new accessories that were once developed for professionals were made attractive by KitchenAid for home users. Some of the features, ​​such as dishwasher safe or suitable for food, as well as the design of the equipment have not yet played a crucial role for the majority of users. Today, the demand is rising for new kitchen machines which include accessories. The TschimmHook® dough hook was a big step in this direction. TschimmHook®, the professional, food grade and dishwasher safe dough hook is made from stainless steel so it is tough and durable. The TschimmHook® dough hook is made with food-grade stainless steel. And the food-grade stainless steel we use, was tested by an independent institute. That means, our stainless steel is dishwasher safe, easy to clean and durable. The unusual design of the curved stainless steel hook, with its clean glossy surface, makes working with KitchenAid® and TschimmHook® not only more efficient, but also an aesthetic pleasure. Stainless steel is easy to clean, timelessly elegant and permanently hygienic. Necessary precautions should be taken to ensure the care and cleaning of stainless steel’s beauty for generations. The stainless steel dough hook can easily be cleaned in the dishwasher. 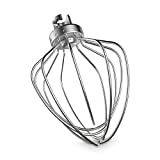 The stainless steel whisk is a perfect tool for preparing egg whites, whipped cream or creamy desserts. With the stainless steel whisk TschimmWhip you can beat effortlessly eggwhites until stiff and whipped cream for soufflés and desserts. The stainless steel whisk encloses the drive shaft completely, separates food from technology and is dishwasher safe. Are you a reseller? Please send us your inquiry. Want to learn more about the conditions for resellers and distributors? We would love to meet you! Please just fill out the form and we will contact you as soon as possible! * KitchenAid is a registered trademark of a company which is not involved in the activity of Thomas Tschimmel, acting as TschimmHook.